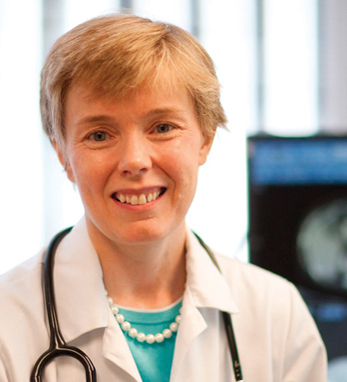 With her medical degree from Trinity College Dublin, Dr. Eileen O’Reilly is a gastrointestinal medical oncologist who serves as an associate director of the Rubenstein Pancreas Center at Memorial Sloan-Kettering Cancer Center and is an associate professor of medicine at Weill Medical College of Cornell University. She completed her fellowship training at MSKCC and has been a faculty member in the GI Oncology service at MSKCC since then. Her primary research initiatives include integration of molecular-based therapies and novel therapeutics for the treatment of pancreatic cancer along with development of adjuvant and neoadjuvant therapy. Pancreatic adenocarcinoma, remains one of the most challenging malignancies. Of 44,000 people diagnosed in 2012, 37,000 died from the disease. “To have a major impact in terms of outcomes, we need to be able to screen successfully and diagnose the disease earlier. Both of those are elusive challenges at the moment,” Eileen, who is Irish-born, said in an interview with Joe Cavallo. At a national level, Eileen is the chair of the National Cancer Institute (NCI) Pancreas Task Force, and a member of the Alliance Co-operative group Gastrointestinal core committee. Dr. O’Reilly is also an associate chair of the MSKCC IRB and Privacy Board, a member of Research Council and is the recent past president of the MSKCC medical staff.